Abstract delegate class for rendering an item in an item view. Rendering of an item in a WAbstractItemView is delegated to an implementation of this delegate class. 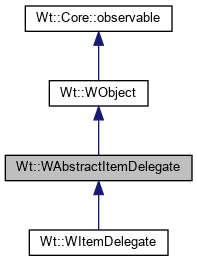 The default implementation used by Wt's item views is WItemDelegate. To provide specialized rendering support, you can reimplement this class (or specialize WItemDelegate). As a delegate is used for rendering multiple items, the class should not keep state about one specific item. A delegate may provide editing support by instantiating an editor when update() is called with the Wt::ViewItemRenderFlag::Editing flag. In that case, you will also need to implement editState() and setEditState() to support virtual scrolling and setModelData() to save the edited value to the model. For an example, see the WItemDelegate. Signal which indicates that an editor needs to be closed. The delegate should emit this signal when it decides for itself that it should be closed (e.g. because the user confirmed the edited value or cancelled the editing). The View will then rerender the item if needed. The second boolean argument passed to the signal is a flag which indicates whether the editor feels that the value should be saved or cancelled. Returns the current edit state. Because a View may support virtual scrolling in combination with editing, it may happen that the view decides to delete the editor widget while the user is editing. To allow to reconstruct the editor in its original state, the View will therefore ask for the editor to serialize its state in a boost::any. When the view decides to close an editor and save its value back to the model, he will first call editState() and then setModelData(). The default implementation assumes a read-only delegate, and returns a boost::any(). Sets the editor data from the editor state. When the View scrolls back into view an item that was being edited, he will use setEditState() to allow the editor to restore its current editor state. The default implementation assumes a read-only delegate and does nothing. Saves the edited data to the model. The View will use this method to save the edited value to the model. The editState is first fetched from the editor using editState(). The default implementation assumes a read-only delegate does nothing. Creates or updates a widget that renders an item. The item is specified by its model index, which also indicates the model. If an existing widget already renders the item, but needs to be updated, it is passed as the widget parameter. When widget is nullptr, a new widget needs to be created and returned. If you want to replace the widget with a new one, return the new widget. The old widget will be removed. Return nullptr if you do not want to replace the widget. You can remove the widget from its parent for reuse with WWidget::removeFromParent(). The returned widget should be a widget that responds properly to be given a height, width and style class. In practice, that means it cannot have a border or margin, and thus cannot be a WFormWidget since those widgets typically have built-in borders and margins. If you want to return a form widget (for editing the item), you should wrap it in a container widget. The flags parameter indicates options for rendering the item. Updates the model index of a widget. This method is invoked by the view when due to row/column insertions or removals, the index has shifted. You should reimplement this method only if you are storing the model index in the widget, to update the stored model index. Returns whether the edited value is valid. The default implementation does nothing and returns Valid.